NFL commissioner Roger Goodell speaks during a press conference after the owners meetings Wednesday in New York. NEW YORK – Don’t expect the NFL to institute a national anthem policy this season, if at all. 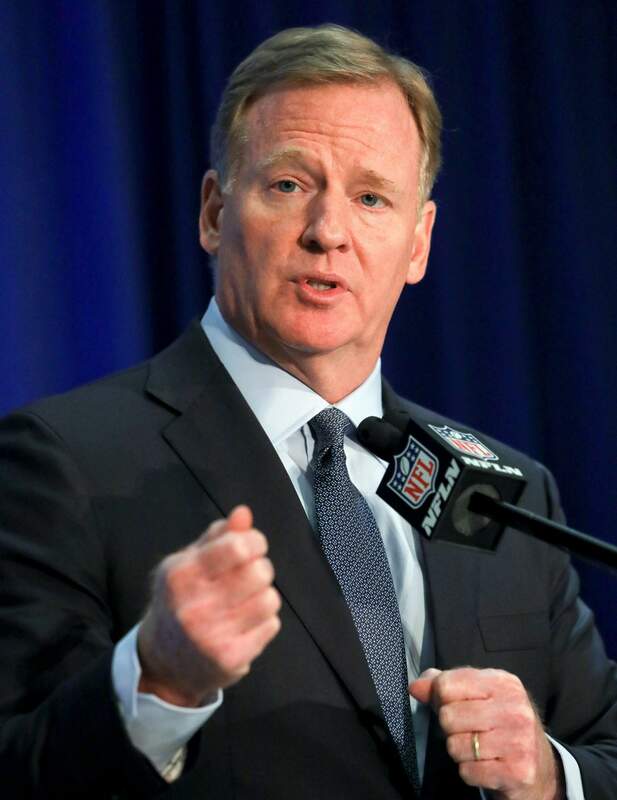 NFL Commissioner Roger Goodell emphasized on Wednesday the work teams and players are doing in the community and didn’t say whether the league and the NFLPA are moving closer toward any agreement on the contentious issue. “The focus of the players’ association, the NFL and all of our clubs and our players is to focus on the efforts our players have continually brought (forth) as their issues in their communities and how can we make our communities better,” Goodell said after the fall meetings concluded. Dallas Cowboys owner Jerry Jones indicated a policy isn’t forthcoming. “I think right now we are going forward just as we entered the season,” Jones said. In May, the NFL passed a rule that forbids players from sitting or taking a knee if they are on the field or sidelines during “The Star-Spangled Banner,” but allowed them to stay in the locker room if they wish. The league left it up to teams on how to punish players. The union challenged the rule in a grievance. The league halted the policy in July. The NFL and a coalition of players have been working in tandem to support player initiatives for a variety of social issues. Last month, coalition members including Malcolm Jenkins, Benjamin Watson, Demario Davis and Chris Long conducted work in the areas of bail reform and criminalization of poverty. Seattle’s Doug Baldwin attended bail hearings and met with grass-roots organizations and the public defender’s office regarding the need to end cash bail in King County on Sept. 25. Coalition members have focused on voting this month as well as voter restoration rights, plus their ongoing work on bail reform. “The focus has been on listening, learning, understanding what the players want to accomplish in their community, the impact they want to have and supporting them,” Goodell said. “Our clubs have done that at historic levels and we’ve gone over that the last couple of days. I’m proud of what our clubs are doing. I’m proud of what our players are doing. We’re all working together to try to address those issues, and from my standpoint that always helps make relationships more productive when there’s respect and understanding and agreement to work together to try to make things better. In 2016, then-49ers quarterback Colin Kaepernick began protesting police brutality, social injustice and racial inequality by kneeling during the national anthem, and the demonstration spread to other players and teams. Critics led by President Donald Trump called the players unpatriotic and Trump even said NFL owners should fire any player who refused to stand during the anthem. Many players countered that their actions were being misconstrued and that they are seeking social change rather than protesting the anthem itself.